Compliant with serial ATA 1.0 specification, revision 2.2. Compliant with PCI Specification, revision 2.2. Two independent Serial ATA channels to support one Serial ATA device on each channel. Breaks Capacity-Limit to Support HDD larger than 137G. 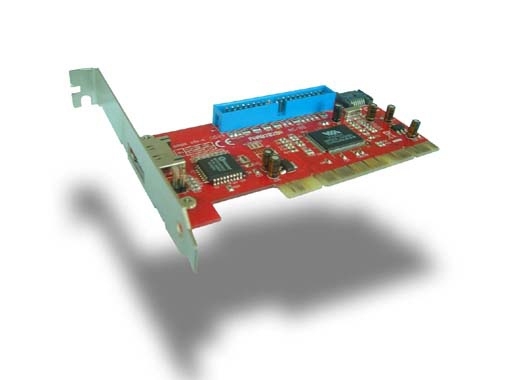 Dual high speed Serial ATA interface ports, each supporting 1st generation Serial ATA data rates 1.5Gb/s. Provides RAID 0 (Stripping) to greatly increase the performance of data transfer by simultaneously writing data to 2 drives. Provides RAID 1 (Mirroring) to protect the data from a disk failure by writing identical data on 2 drives. Supports Spread Spectrum in receiver. Independent 256-byte FIFOs (32 bit * 64 deep) per Serial ATA channel for host reads and writes. 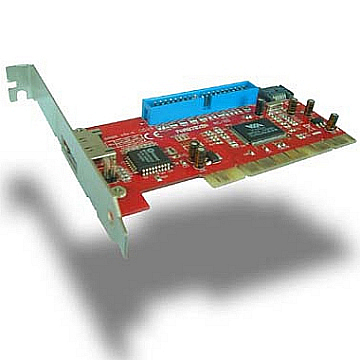 32 bit, 33/66MHz fully compliant PCI host interface.